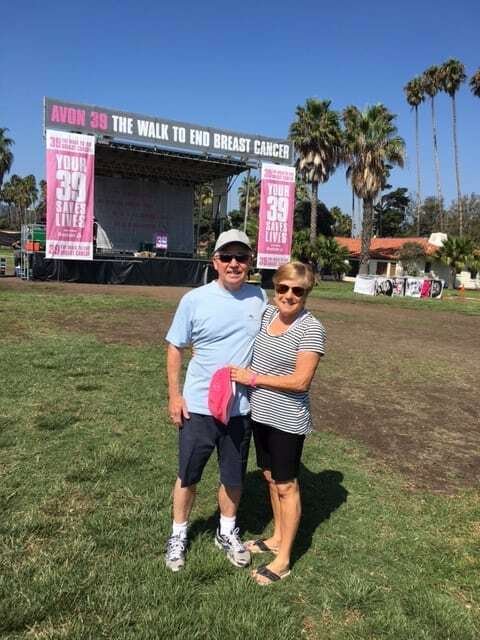 Once again, I was honored to be a part of the Avon Walk To End Breast Cancer in Santa Barbara. Since this walk started in 1992 the event has raised over $600,000,000 for the cause. The funds are funneled by the Avon Breast Cancer Crusade to local and national organizations that help women and men, regardless of their ability to pay for treatment, get the breast cancer health care they need. These programs provide funds for accelerated breast cancer research and improve access to screening, diagnosis, treatment, and education. My wife is a survivor of this disease. She is a nurse who has herself completed the Avon Walk. For the last 9 years, she headed up the medical crew that takes care of the walkers on the route. I have been helping on various crews as well. For the last few years, I have been on a rest stop crew providing water and other support for the walkers along their route. The Avon Walk is not a timed race. It is a walk connected with the fund raising that the walkers and crew do before the race. That is not to say it is an easy walk. On the contrary, the walk is 26.2 miles the first day and 13.1 miles the second day. Most walkers spend the night after the first 26.2 miles sleeping in tents and eating with other walkers in huge tents in the wellness village. As their website says, “Warriors Wanted”. The transformational challenge that asks you to dig deep in order to rise hight. This is a great cause and if you would like to find out more or participate, please go to their website here for more information. The Economic State of Los Angeles is Good!